Joan Inglis, Interior Designer and Master Accredited Staging Professional®, was honored as one of The Mecklenburg Times' 50 Most Influential Women in Charlotte, NC. Inglis owns Carolina Spaces Furniture & Design, a high end furniture sales center in Belmont providing full service interior design, model home merchandising, and specializes in home staging for luxury properties. Charlotte, NC, May 28, 2018 --(PR.com)-- The Mecklenburg Times named Joan Inglis, owner and lead designer of Carolina Spaces, LLC, an interior design, model home merchandising and home staging firm based near Charlotte, NC, to its 2018 class of "50 Most Influential Women." Inglis was honored May 18th at a special event at the Hilton Charlotte Center City. 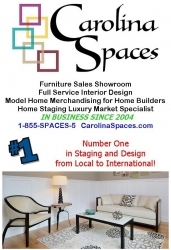 Carolina Spaces provides award-winning interior design, model home merchandising, and home staging services throughout the Carolinas. Their model home merchandising and design services are available to home builders nationwide. Carolina Spaces' Owner and Lead Designer, Joan Inglis, is frequently featured at home building conferences conducting educational design seminars including NAHB International Builders Show, Southeast Building Conference, NCHBA 21st Century Building Expo and Conference, and HBASC Convention and Expo. For professional assistance call toll free 1-855-SPACES-5 or visit www.CarolinaSpaces.com.